My Small World Templates - Sew What, Sherlock? Added Oct. 18, 2017: Top answers to questions I am asked on a very regular basis. Yes, I am still sending out the templates. No, you don’t have to send your instagram username, you do not have to use Instagram at all, and please do not send your photo to me via Instagram. You can own either the magazine or the pattern booklet. Consider donating via PayPal. No, it’s not required. The button’s at the bottom of the post. Email a photo of you holding your pattern and a piece of paper with your name and the date written on it to sewwhatsherlock at gmail dot com. Recently I’ve been participating in the #mysmallworldqal over on instagram. The original pattern is by Jen Kingwell (I worship at her quilty feet) and it’s found in the Spring 2015 issue of Quiltmania. I’ve just finished part 2 and expect to dive into part 3 today. 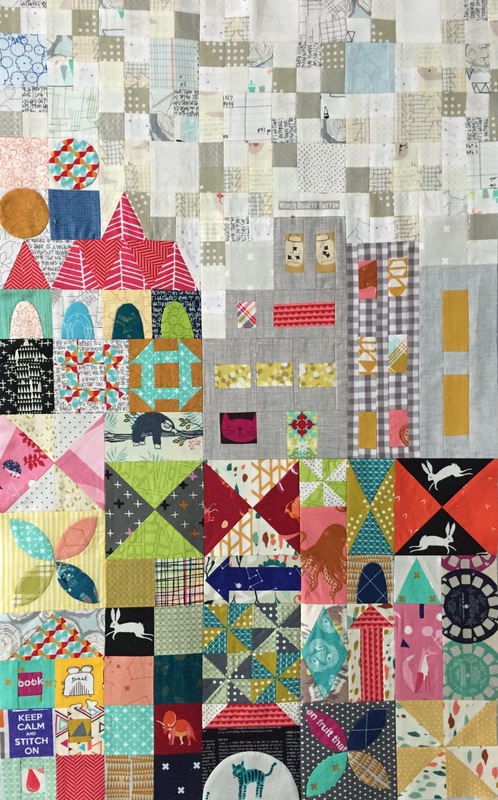 The pattern is written in a fairly inefficient way, with all the individual pieces being cut out using templates or measurements then sewn together to make one quilting unit. There are a couple of problems with this: 1) It’s incredibly inefficient with all that time cutting from templates, inaccurate seam allowances cause major problems even if only slightly off, and I KNOW several sections could benefit from paper-pieced patterns. 2) There are quite a few mistakes in the pattern. I know that it is very complicated and some mistakes are bound to slip through, but I have to wonder if Jen Kingwell really intended for her pattern to be distributed in this way. I wonder how she feels about all the trouble people are having? But then maybe she didn’t expect it to be this popular. Who knows. So I have converted the blocks that lend themselves to paper piecing into a printable PDF. It’s not pretty. The templates aren’t numbered and I too have made mistakes. I’m only through part 2, as I said, so while I did include templates for all the sections, I’m still editing and adding to the templates as I go. When I add or change something major I re-email them to everyone. Anyway, for those of you who stumble across this post looking for my free paper-piecing templates for the My Small World pattern, here’s how it works. You’ve got to send me a “ransom” photo. Meaning a photo of you holding your copy of the Spring 2015 issue of Quiltmania magazine and a piece of paper showing your Instagram handle or full name, and the date. Send your ransom photo to me at sewwhatsherlock at gmail dot com and I’ll send you my copy of the paper piecing templates. Easy peasy. Oh, and my templates are only in US measurements, so if you’ve already started with centimeters they probably won’t work for you. Update: The same rules apply for people who own the newly released paper pattern, just snap a ransom pic and I’ll send you the templates. Disclaimer: 1) I am trusting that if you have access to a copy of Quiltmania you also have access to make the pattern from said copy. 2) I really am looking at your photos. I’m keeping them too, so many bright smiling faces 🙂 3) I trust that if I send you the templates, you will not share them with anyone else. Instead, tell your friends to buy the magazine and email me their ransom photo, it’s quite simple. Finally, I’ve had a couple of people ask about donating money to thank me for my time. So here’s a paypal button for that purpose. I absolutely do not request or require donations, but they are certainly appreciated. I am not accepting money in exchange for the templates, they are free for anyone who proves ownership of the pattern. Thank you! I’m up to Part 3 as well, although don’t know if I will be starting on that part just yet as it is meant to be a slooow project for me but it is starting to pull me in. Thank you so much for this! You are spot on about the difficulty of the pattern. I’m working now on Part 3 and it takes a major brain investment to gear up to do it (except the sky, which is kind of fun). Just wanted to comment on the writing style of this pattern. I may be older than you…. But this is how most patterns used to be written. The assumption is that you will think about the process and develop your own methods based on your knowledge – this was rated a 3 I believe – not a beginner pattern. The internet has spoiled us by having so many detailed tutorials that at times we forget to think:) That being said – I don’t mean to offend since I read your blog and know you are an incredible quilter but thought this might shed some light on it. I’m on my 3rd Kingwell pattern and am loving it. Well that would be nice but it seems the magazine cannot be purchased anywhere-I have been trying for 2 months. I guess Quiltmania does not care about missed sales. done with the Small World Quilt. I’ve tried everywhere for the magazine and nada (and yup, I’d take the French verison too????). Any possible chance your offer for the pdf paper piecing would be available if I can get the proposed pattern that’s supposed to be coming this fall? I’d be glad to send you the ransom photo with the pattern picture! And even if you can’t make that offer for the stand alone pattern, thank you for being the kind of person that shared your talents and made the initial offer. You rock! These sound like the way I need to go. I started during round one and I only managed to epp the hexagons! Off to find my pattern……. So glad to see this. Found my way to here via Wendysquilts . . . . and plan to ransom myself with a picture of my FRENCH version of the magazine sometime soon. Just found out about your FPP templates on instagram and have plans to ransom myself in a few minutes! Forgive my appearance but it is worth it to help with the pattern. Thank you for contributing to the project. Hi. I’m not on Instagram & have never used it. Is there another option for sending you a ransom photo? I ordered the magazine on Thursday and it arrived the day after, which was great. Would you accept a copy of the actual pattern? I need those templates desperately and can’t find the magazine. ???????? Sarah, I don’t do Instagram. May I send a photo another way? I’ve started section 1 already but your hard work would be so helpful. Thank you! 1) No, you don’t have to use instagram. 2) Any version of the pattern is fine, booklet or magazine, French or English. 3) Your photo should be emailed to me, not sent via instagram. The sharing started on instagram, that’s why it’s referenced so much, but it’s not a requirement. I am finally getting around to making this quilt and I am SO grateful for your templates. It is making the whole quilt more enjoyable. I just wanted to let you know that your hard work is very appreciated! I was wondering if you are still doing this because I am planning to purchase the Spring 2015 Quilt Mania issue as I really want to make the My Small World quilt. Thanks! Thank you so very much for the templates. I am on the last section! Your templates have been a god send. I never would have gotten this far without them. 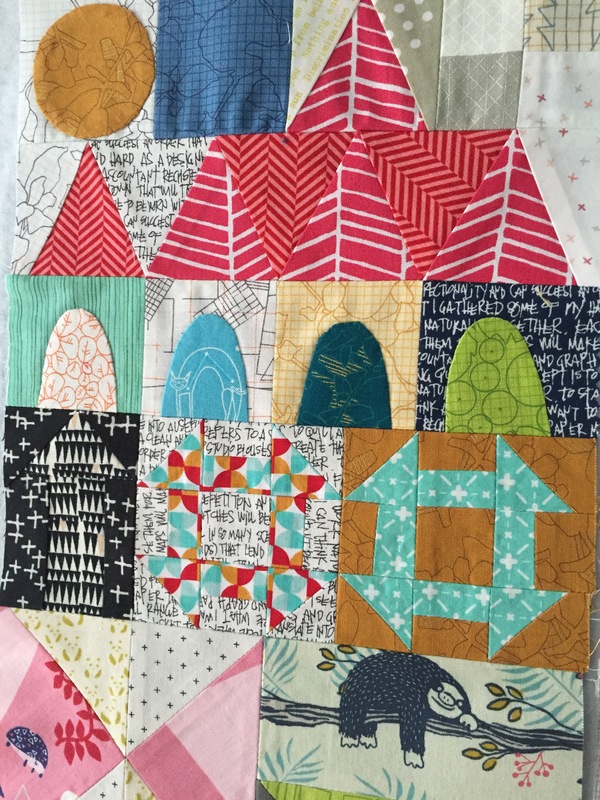 I have been doing the quilt as a block (section) of the month through Homestead Hearth and I am very please with myself for keeping up with the shipments. I am going to have it finished in time to display at my quilt guilds show next Spring. Thank you! Hi, I have my pattern on order from Australia, just realized it is in my quilting store in Burligton, but it has already been shipped. The Village quilt shop is where I buy my fabric and she did a workshop on this quilt last year, but I was doing a block of the day. So I am now going to start My small world and love your templates. Hi Ruth, when you get your pattern please follow the instructions above to get the templates. Happy Sewing! Hi again Sarah, I am working on the first section and the second part, the building in the middle with the six windows is 1/4 inch longer than the 91/2 inch side strips, do you remember that being the case? got that worked out, did the math, I am sorry that so many people have closed down their sites for this project, the instructions are very vague and although I have been quilting for five years, have never done a pattern like this.. always cutting squares and following simple patchwork patterns, I would love to continue to expand my quilting expertise and I thank God for the internet, but would just like to have the quiltmania pattern as I guess this was a great help. Any advise you can give me would be greatly appreciated. Thanks so much Sarah. How do I contact Sarah Bailey to send my ransom photo to receive the free templates for my small small world quilt? Do you know? Hi, what if I do not have that particular Quilltmania Issue but have purchased the book? If I send a pic etc, could you consider that as acceptable. Hello Sarah- My shop, Quilt’n’Things Fiber Arts (in L.A. County), will be doing a Sew Along with this pattern, and I’ll offer your paper piecing option to participants. If anyone is in need of the pattern I’m selling at my store, so just email me at qntfiberarts@gmail.com. Sarah, it’s really kind of you to offer these templates. Please contact me cuz I’d like to send you a thank you gift from my shop! Thanks for the paper piecing. I have just started the quilt. I tried piecing without templates the peaky and spike block, only to find out that there were no seam allowances. It was a mess. The paper piecing is so much easier. Can you tell me what the letters on like the arrow block (AB + AD and H + J) stand for? I will try to send you the required photo for your paper/template/simplified instructions of MSW. I made several sections, but am totally unhappy with the way it looks. Not as precise as I like to work, (nor do I love my fabric choices). I plan to start all over once I receive your guide/instructions. I can not let a pattern “win”. The pattern is akin to mountain climbin. It requires blood, sweat and tears to conquer, but then: enjoy the view. Anyone know where I could get a copy of Quiltmania Spring 2015. Thanks.